“Animal Kingdom” Film Review – “Animal Kingdom” Film Review featuring Guy Pearce, Ben Mendelson, Joel Edgerton, Luke Ford and Jacki Weaver. Set in the Melbourne (Australia) criminal underworld and the environments of the rival law enforcement, the Kingdom involves “Pope” Cody (Ben Mendelsohn), a armed robber in exile because of a betrayal involving corrupt cops. His gang is also in a downslide, as his main business partner Baz (Joel Edgerton) wants out, and his brothers Craig (Sullivan Stapleton) and Darren (Luke Ford) are muddling through with other pursuits. To this coterie comes a 19 year old nephew, nicknamed “J” (James Frencheville), who comes to live with the family after his mother dies. He is immediately put under the wing of the family’s matriarch, Janine “Smurf” Cody (Jacki Weaver). Smurf is more than a “smother mother,” she literally holds the family together through sheer will and bizarre passive aggression. 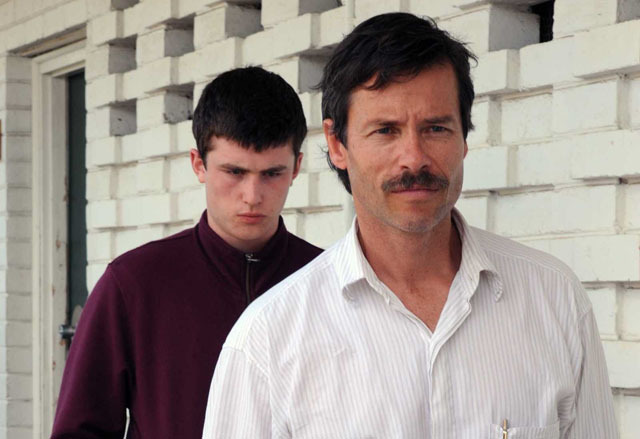 To capture and prosecute the Pope, Melbourne Detective Nathan Leckie (Guy Pearce) infiltrates the family through J. The police officer offers the boy witness protection, after a caper goes wrong and other cops are killed. Pope begins to threaten family members, including J’s girlfriend (Laura Wheelwright). While Leckie tries to hold J on the law and order side of his world, his grandmother, uncles and their criminal ties seek to exploit him. This is a crazy quilt of dysfunctional family dynamics, led by a “mother” role that joins the great ones of cinema history. Jacki Weaver fashions the Smurf character as a master manipulator, not only of her own relations but that of the nasty police, legal system and mass media. It is truly a performance to behold, made more increasingly uncomfortable as each of her infiltrative master strokes are revealed. Weaver understands the character completely, and adds a strange allure to the persona that shakes the foundation of motherhood to the core. David Michôd’s script is a fascinating combination of heroic obsession – Guy Pearce as Detective Leckie – and well-intentioned actions crushed by the wrong decisions. The cops and robbers are equal opportunity corrupters, as the lure of money and power turn law enforcers towards the criminal elements and turns the robbers into viable “citizens’ who hide behind their well-paid legal representatives. In a sense this is a microcosm of society, in which behind every fortune is a great crime, and subsequently lawyers on retainers to prevent that crime from being discovered. Guy Pearce, so memorable in his roles in “L.A. Confidential,” “Memento” and “The Hurt Locker” seems to be making a transition as Leckie. He isn’t as facially angular in this middle age role and imbues Leckie with a world weary desperation. His pursuit borders on the excessive, in his intent to bring the Cody family down. He tries everything with J to garner his confidence, but his body language and state-of-being seems to understand that his actions are futile. He is a heroic anti-hero, willing to expose his humanity within a dark and ugly circumstance. All the character development is top drawer, especially Ben Mendelsohn as Pope Cody. His role interpretations create chilling mistrust from his first appearance on. James Frecheville as J projects innocence and moral frigidity at the same time, hoping to indulge in the criminality while selfishly playing footsie with the law. The maturity of playing out this dilemma belie the actor’s youth. There is a great scene with one of his uncles after he doesn’t wash his hands in the bathroom. He is dressed down like a boy, and has the sheepish expression of one who doesn’t know any better. This same expression comes through when he is asked to partake in a crime. And speaking of great scenes, there is another in a grocery store encounter between Leckie and Mother Smurf. They have played the game to a draw at that point, and the tension between them is palpable. Michôd’s script lets Jackie Weaver use her motherly instincts to passionate perfection and the cop/mother exchange blazes like fireworks shot off all at once. The title Animal Kingdom refers to the law of the jungle. The innocents are eaten and the predators feast. In an increasingly complex societal structure, as illustrated in the film, it is the predators that keep coming back and asking for more, while the rest of society blithely accepts whatever scraps are left behind. ”Animal Kingdom” continues its limited release nationwide in Chicago on August 20th. Check local listings for show times and locations. Featuring Guy Pearce, Ben Mendelsohn, Joel Edgerton, Laura Wheelwright, Luke Ford, James Frecheville and Jacki Weaver. Written and Directed by David Michôd. Click here for the HollywoodChicago.com interview of David Michôd. Rent out the complete Guy Pearce back catalogue today at LOVEFiLM. Head over to LOVEFiLM to see all the latest DVD releases and old classics.